I had webroot on my mac and then all of the sudden it asked for a key code. All the ones I had did not work so I went ahead and purchased a 5 device one for 3 years. I was able to get it on my phone, but for some reason it won't let me add it to my mac. I have installed and uninstalled and I have gotten two different things. Second if I used an old webroot I had from my time machine it allows me to put in the key code but it says it failed to install the latest verision. 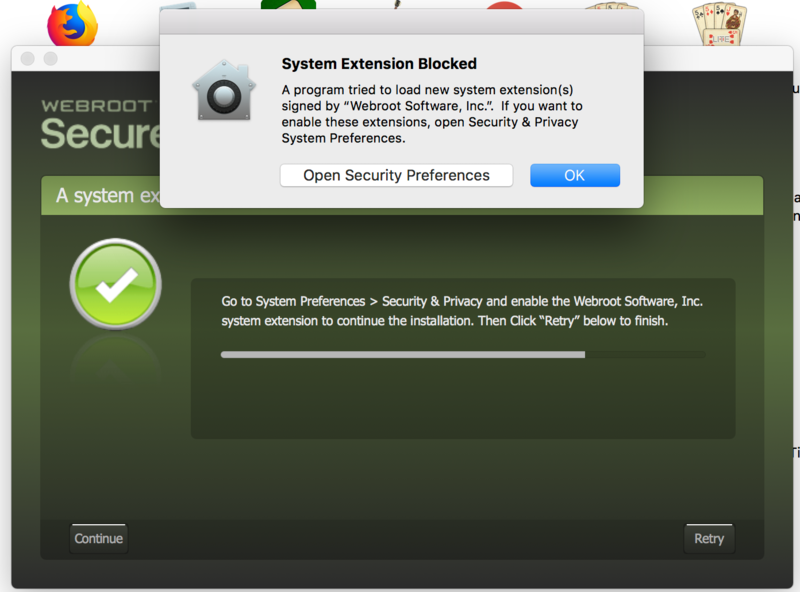 If this is what you are getting, go to "System Preferences" and "Allow" Webroot to install. Have you tried these steps below? Shut down SecureAnywhere by clicking the Webroot icon [img]http://sw.nohold.net/Webroot/Images/wsa_icon.png[/img] in the menu bar and selecting Shut Down SecureAnywhere. 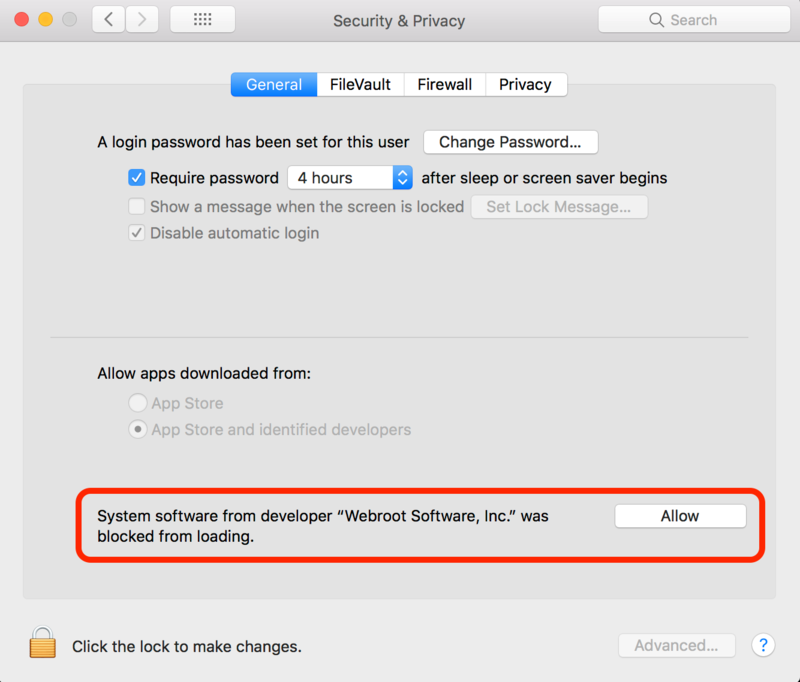 [img]http://sw.nohold.net/Webroot/Images/macwebrootmenushutdown.png[/img] If prompted, confirm that you want to shut down SecureAnywhere. Open the Finder by clicking the Finder icon [img]http://sw.nohold.net/Webroot/Images/mac_finder_icon.png[/img] in the dock. Click and drag the Webroot SecureAnywhere program icon into the Trash [img]http://sw.nohold.net/Webroot/Images/mac_trash_icon.png[/img] in the dock. A confirming window appears. Click Uninstall. [img]http://sw.nohold.net/Webroot/Images/macuninstallwsa.png[/img] Webroot SecureAnywhere is now uninstalled. There is no need to restart your computer. Click here to download the SecureAnywhere installer to your Mac. If you still are having issues please Contact Support and they can fix this up for you quite easily, This is free of charge with your Webroot subscription. (Support is available 24/7). I already did all this and nothing. I opened a ticket and no response yet. It's frustrating because I just spent so much money and only have it on two phones right now . Sorry about that...have you tried just entering your new keycode? If you receive a new keycode from Webroot, you can activate it from the My Account window. Click Activate once you have done this and allow the program to run a scan. Thank you for getting back to us. I am afraid that the Webroot Support Team will need to fix this for you. Don't worry they will surely take care of you and your money will not be lost. I apologize for any inconvenience that this has caused. This is not normal for Webroot to cause this kind of issue. I have had Webroot on my Mac for nearly 4 1/2 years. Uninstalling/reinstalling has not been a problem or updating automatically. But I also do not have High Sierra either. So it must be on the back end and Support might need to do some Sudo Commands. . Please be patient and the Webroot Support Team usually answers back in 24-48 hours. If not sooner.